An expressive orange-ware clay vessel in the Toltec style, frae the American Museum of Natural History collection. 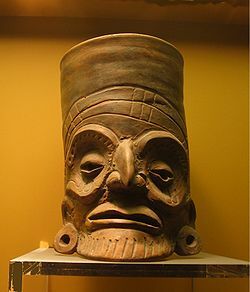 The Toltec cultur is an airchaeological Mesoamerican cultur that dominatit a state centred in Tula, Hidalgo, Mexico in the early post-clessic period o Mesoamerican chronology (ca 900–1168 CE). The later Aztec cultur saw the Toltecs as thair intellectual an cultural predecessors an descrived Toltec cultur emanatin frae Tōllān [ˈtoːlːaːn] (Nahuatl for Tula) as the epitome o ceevilization; indeed in the Nahuatl leid the wird "Tōltēcatl" [toːlˈteːkat͡ɬ] (singular) or "Tōltēcah" [toːlˈteːkaʔ] (plural) came tae tak on the meanin "airtisan". This page wis last eeditit on 3 Apryle 2017, at 01:12.